I have been playing a lot with Arista hardware lately, as we’re mainly using their products in our data center’s as Tor or Spine switches, but not only. We were already using a multi-layer switch (mls) the Arista 7150S-24 as an edge router . It’s quite uncommon to have this device in such a place but we needed it in order to route the smallest packets (cf my previous blog-post) at 10Gbit/s line-rate and it performed very well in this task. It performed so well that it became one of our main Internet routers. A 10GbE interface connected to the upstream provider router. Interconnection subnets for IPv4 and IPv6. Two default gateways (v4+v6) pointing towards the IP-Transit provider router. Public subnets (public#1, public#2) associated to different VLANs with the mls configured as their gateways. IP resources announced from a VM running OpenBGPd using multi-hop eBGP sessions (v4+v6) with the provider. Create the BGP sessions directly from the edge-router instead of using multi-hop eBGP. 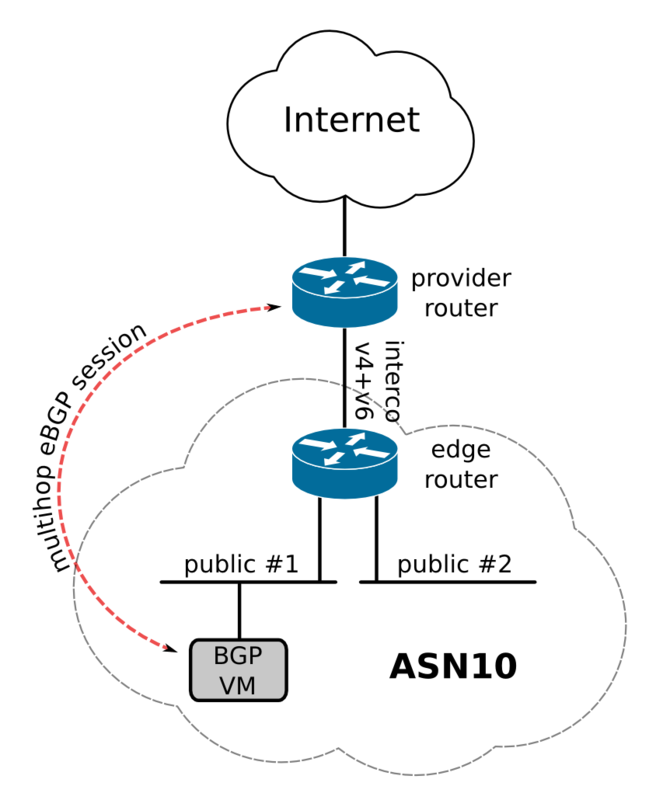 Ability to store the full BGP tables for each ASN on the edge-router to push them further. The whole setup must be dual-stacked. The BGP tables should never be pushed to the switch FIB, the routing decision should only be based on few status routes for performances reasons and to bypass the hardware limitations. 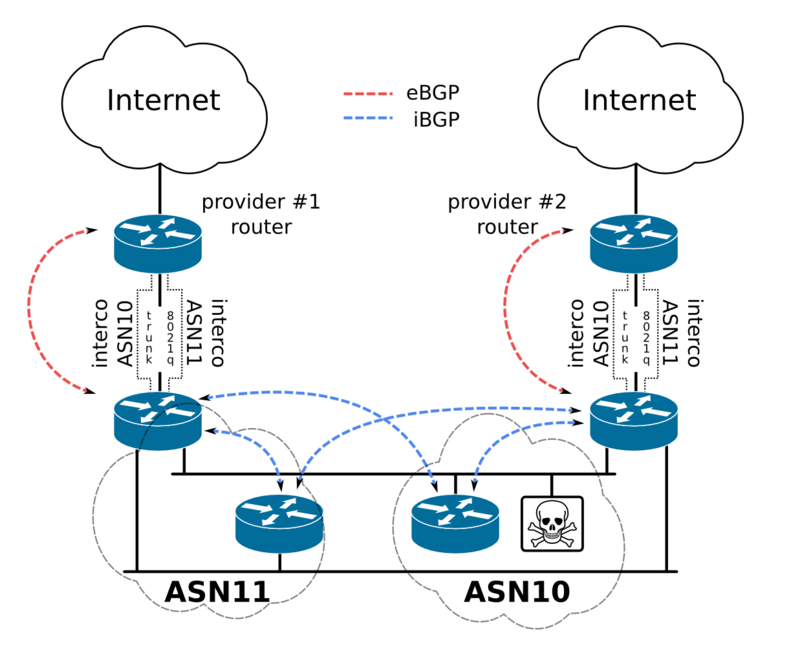 The impossibility to have multiple ASNs configured at the same time on the BGP daemon. The Arista 7150S-24 mls is only able to store 12’000 entries in its FIB, and there’s no way to store the tables into the RIB without pushing them in the FIB. We’re far away from the +550’000 routes for IPv4 and the +20’000 for IPv6, and this is only for one ASN. By curiosity I tried to remove the 12’000 entries soft-limit and I sent a full BGP table to the router FIB. Believe me, you don’t want to do this. The process responsible for pushing routes into the TCAM was acting like crazy, eating all the CPU, trying desperately to push the routes into its hardware and then it decided to commit suicide after a few minutes of pure panic. So my setup was pretty screwed after that episode… but! Remember that those switches are running on Linux, and not a stripped down version like it’s often the case with embedded hardware but a full blown x86 Fedora distribution. I decided to replace the BGP routing engine with the awesome BIRD. If you don’t know this remarkable piece of software yet, I suggest that you have a look at its website and its features list. The latest Arista software version at the time of this post is EOS 4.15. It’s based on a quite an old Fedora 14 version, if any Arista developers are reading this: Hey guys do something it’s getting quite old now! The Bird packages from the Fedora 14 repositories were as old as the distribution (Bird 1.2.5 from 2010), so I decided to compile the latest stable version from the sources. 6. We will have to compile Bird twice, this first time to have the IPv4 enabled daemon and then a second time to have the IPv6 one. When the compilation is finished we’ll move the compiled binary on the persistent partition of the switch, otherwise it won’t survive a reboot. Now that we’re done compiling stuff, we won’t need to clean what we downloaded or installed, the next reboot will do that for us (my 2 cents: take 60 seconds to make the vim binary persistent too, it’ll save your nerves later). Then we will create the init script that copies the binaries from the persistent storage to the executables path and the config files, in the end it will start the two daemons. So at this point the daemon will be started automatically during each switch startup. The last part is now the bird configuration. I voluntarily omitted the IPv6 configuration for the sake of brevity as the concept was the same for both protocols. Last thing we have to do, now that we have two uplinks with the upstream provider, is to configure two default gateways; one for ASN10 and one for ASN11. Wait, what what? Two default gateways? 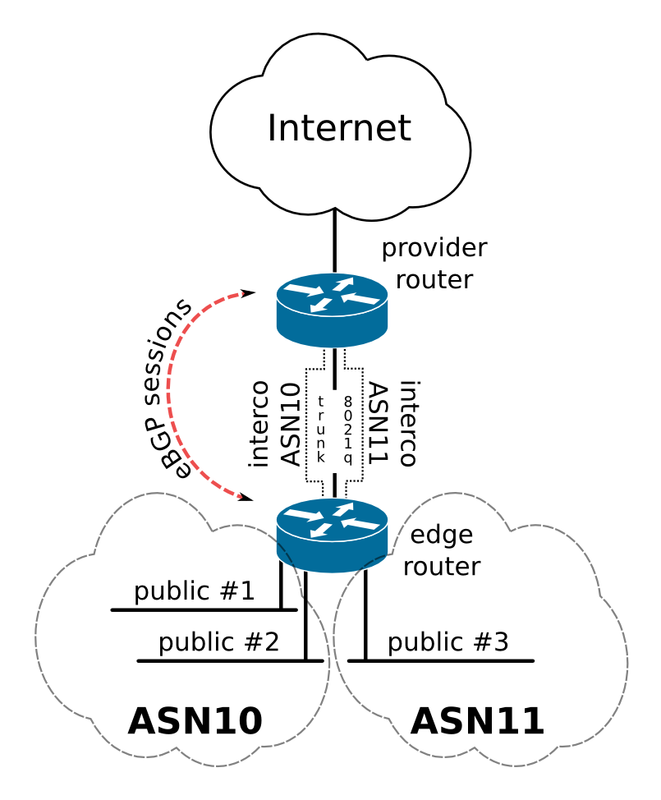 Yes we’re not talking about ECMP here but two different gateways for each ASN. This is something that is now possible with isolated routing tables, also called VRFs. Arista VRFs are using the Linux Kernel isolation mechanisms (namespaces) for routing table isolation, all we have to do is to group interfaces part of ASN10 into the same VFR and apply the default route to the VRF. Then do the same for then second VRF for ASN11. So with this setup, when the switch starts, the BIRD daemon will establish the BGP sessions and advertise the respective routes for each ASN. So far so good. The bird daemon will store the BGP tables for each session separately without pushing them to the switch FIB, as we asked it to do. We will use it for the next step. Let’s move a bit further, now we want to push the BGP tables to the down-stream routers, they will use those tables to make their routing decision, unlike the edge-router. BIRD allows the previously learned routes to be redistribute to any other protocol. You’ve certainly noticed the pirate flag located on the public #2 in the above diagram. That’s the main ‘raison d’etre’ of this setup. This guy can push 14Mpps and fill the upstream provider pipe. As a comparison, a CISCO ASR9K is able to route 7Mpps, that’s half of what we can expect, using 10GbE and we’re talking about carrier-grade routers. So we didn’t want to put it behind routers having to perform lookups in large routing tables. Moving the “real” BGP routers from the edge of our network to a lower layer and leaving dumb-but-powerful multi-layer switches in front of them, allowed us to leverage the physical limitations of these routers. It created a kind of cheap pps-DMZ in front of the routing-decision-taking-routers. Replacing the BGP routing engine will remove the ability to push BGP learned routes into the ASICS switch, at least I haven’t invested time in that, it might be doable. I also tried to replace the OSPF engines using BIRD but this time I wanted to push OSPF learned routes into the switch hardware, so I kept the Arista official engine. Replacing the Arista switches with cheaper mls like cumulus-linux-ready switches is definitely an interesting direction we should explore. Previous Post: Machine learning and security: who should care? If I could offer a suggestion, repacking the bird binary into a SWIX is the “proper” Arista way and will allow for simpler portability and persistence. I did find that it was necessary to bind mount /usr, /bin and /var/cache/yum to a USB disk to avoid filling the root fs during compile. I used VEOS to make the package, so a production switch didn’t get borked! Actually, to update my last post, I went one better.